Here is a great healthy, sweet and savory appetizer and a great giveaway! Beets and balsamic caramelized onions top slices of fresh baguette with crumbled goat cheese on top. I have been so excited for today for like ever. I have a super duper scooper exciting giveaway for you guys. Yes you! 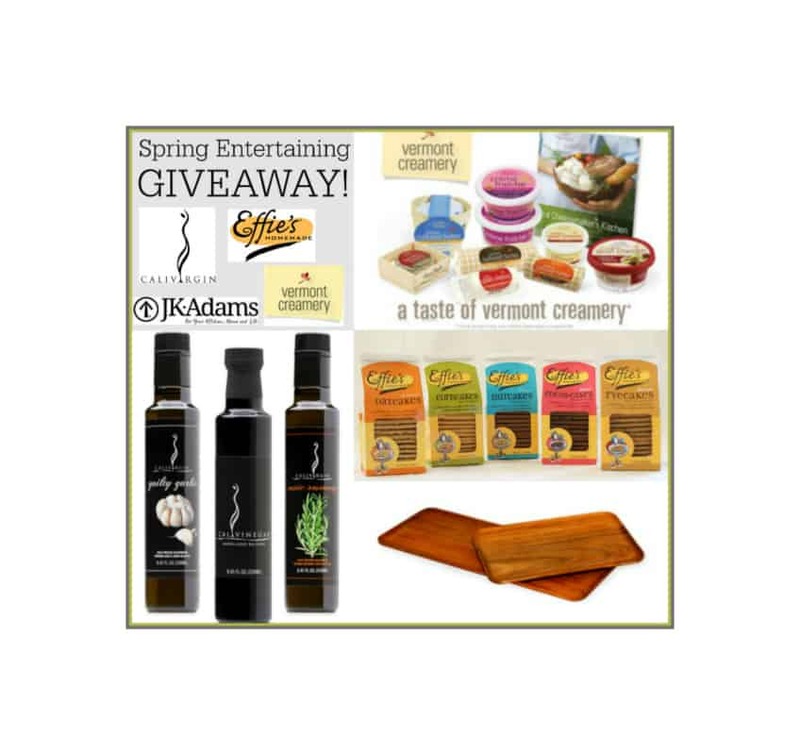 It is a great big spring entertaining giveaway that I put together with a group of blogging friends and four awesome brands, Vermont Creamery, JK Adams, Effie’s Homemade and Calivirgin. One winner is basically going to get a party delivered right to their doorstep. No joke! I came up with the idea of putting this party together a while back when Vermont Creamery sent me a box of these amazing goat cheese crumbles. They come in plain, cranberry tarragon, tomato and basil, and apricot and thyme. They are all so yummy, and unlike a lot of commercially available crumbled goat cheeses, these are totally free of preservatives! 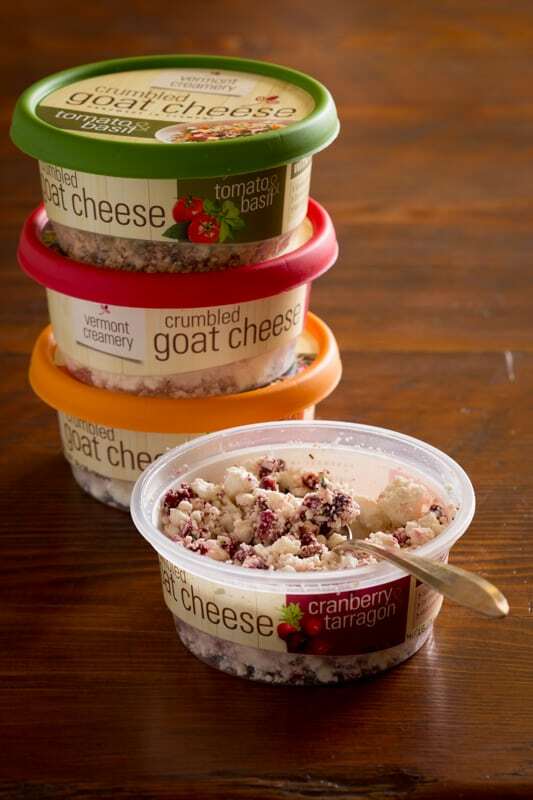 Can I just say how ridiculous it is that these containers of pre-crumbled goat cheese make me so happy? It is so easy to have them on hand. I just toss a spoonful or two into a salad. And I have been adding the basil and tomato chevre crumbles into my scrambled eggs. Yum! Then I made these beet and caramelized onion bruschetta with the crumbled goat cheese on top. I used the cranberry and tarragon flavor and the apricot and thyme as well. Oh Boy! Though I have to say, simple unflavored fresh chevre would have been pretty incredible too. Anywhoo, when I made these I was like Man, I wish I was having a party right about now and serving these up! And then I started thinking well I bet my readers would like to have a little party right about now too! 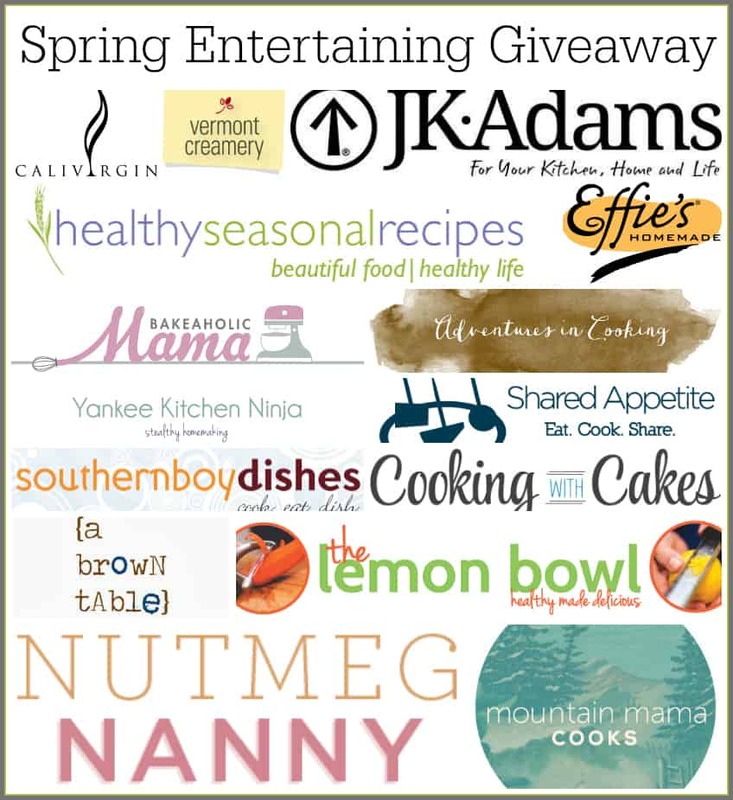 Thus spawned the Spring Entertaining Giveaway! Please enter the giveaway using the widget below. In addition to a sample of the crumbles I mentioned, there will be much much more in the prize packages. See it all above. Also I would love it if you took a minute to pop over to visit the other bloggers who are running this giveaway too to see what they made for the party. Place beets in a large saucepan and cover generously with water. Bring to a boil, reduce heat to maintain a gentle simmer and cook until a fork inserted into the flesh of a beet comes out with little resistance, about 40 minutes. Note that over-cooking will make it difficult to slice nicely. Drain and cool until cool enough to handle. Rub skin off of beets. Slice as thinly as possible, using a mandoline or sharp knife. Divided beet slices among the baguette slices. Sprinkle with salt and pepper. Top with caramelized onions and goat cheese. 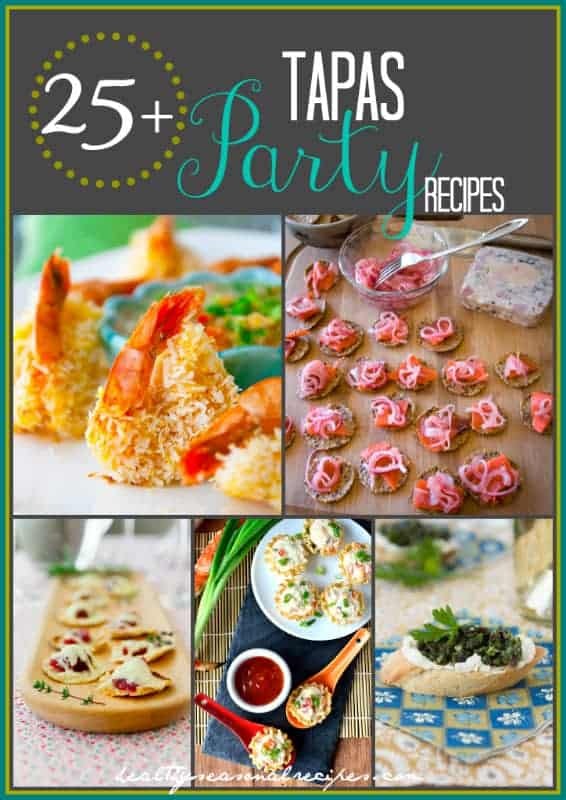 For more ideas of what to serve at your party check out these 25 Tapas Party Recipes. And here are 22 tips for effortless entertaining. Yum! Bruschetta is a such a great choice for entertaining! Thanks for putting the giveaway together! Thank you Kelley, and I am so glad you are a part of it. I’m also glad that Vermont Creamery introduced me to you and your blog. 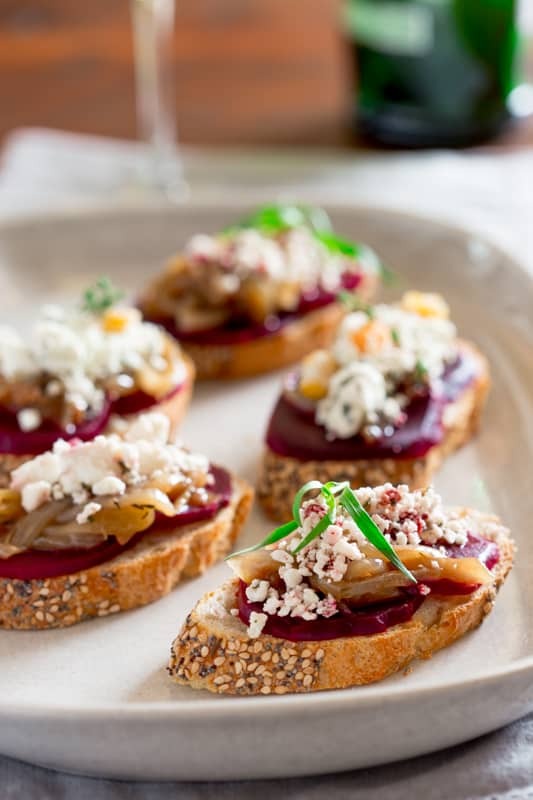 I love beets and this bruschetta with onions and beets, delicious! However, I have never ate goat cheese. Yay! So glad you’re in on this giveaway too Christine. Always have a cheese platter, olives, and pickles! I don’t think a party is complete without sangria..there is some for every season! Homemade crackers and a fresh dill dip are real favorites in my neck of the woods. Nice contest, thank you! We love finger food at a party – bruschetta is a must, as is a great cheese platter with some fruit. Sounds perfect Mary! Luck to you. Hi Karen. I always serve cheese and wine myself too. Best of luck! What a great combination, love bruschetta along with cheese and fruit. This bruchetta looks amazing Katie!! Such beautiful colors… I need to add this onto my entertaining recipe rotation. And thanks so much for including me on this awesome spring entertaining giveaway! It was a blast being a part of! And I can’t stop eating those Effie’s oatcakes! So good! Chris, Oh thank you. They are so simple. Hope you like them 🙂 Thank you for being one of the bloggers in the giveaway! Such a fun prize. Yum! Good luck in the giveaway Auntiepatch! My favorite party food has to be guacamole or anything with avocado! Your recipe above sounds wonderful. Can’t wait to try it. Lynn, Thank you so much. I love avocado too. 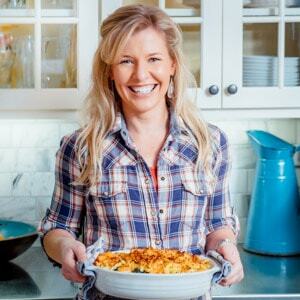 If you haven’t already be sure to check out Christine’s recipe. The link to her site is above (Cooking with Cakes) It looks amazing. I can’t wait to try it myself. Good luck in the giveaway. I love to serve baked brie in puffed pastry! It presents so well and is delicious too! How can you go wrong with beets and goat cheese?! Gorgeous photos – thank you so much for hosting such a wonderful giveaway! Honored to be included! Thank you so much Liz. I’m so glad you could join in. I love baked polenta crisps with melted organic mozzarella! don’t really entertain as I have no space to do so. Katie, I’m such a beet freak and I’m serious when I say that there’s nothing better than beets and goat cheese. Expecially the cranberry tarragon variety (love that stuff!). These bruschetta look amazing!! Thanks so much for coordinating the giveaway. It was great fun to participate! Have a great weekend! So glad you joined in Bill. I love your recipe too. 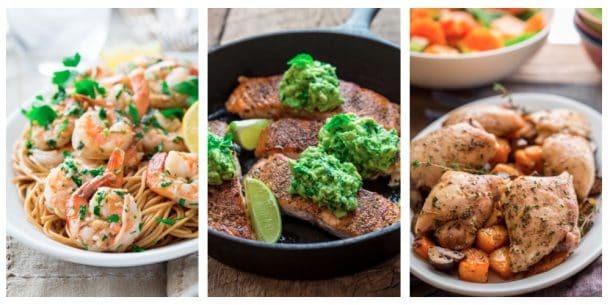 Such fun to see how our menus shift at this time of year to much such springy recipes! I am a little bit obsessed with bruschettas and any fun toppings you can smash onto a slice of bread, so this is great! Those crumble flavors – whoa. So good. Thanks so much for the giveaway! I agree totally! Bruschettas are so fun to get creative with. Thank you so much and for coming by to say hi. Can’t wait to meet you IRL next month for the race. It’s not a party here in Wisconsin without beer! Diet coke is always a classic for a party. Cheese and crackers is the best appetizer as well. Divine recipe- love the sound of the goat cheese crumbles! Katie, thanks for putting this wonderful giveaway together and including me in it. We tried your bruschetta recipe over the weekend and it was delicious! 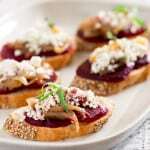 I love the idea of the beet bruschetta. The goat cheese crumbles sound wonderful! I want to try the one with cranberries on green beans. I will have to look locally to see if I can get these items. Love the idea of a party, all these items are lovely. Thank you. As always, it looks lovely and sounds absolutely scrumptious! My current favorite food to bring to a party is a roasted corn/beet salad. Nice and fresh with a good crunch on the roasted corn. Love it! 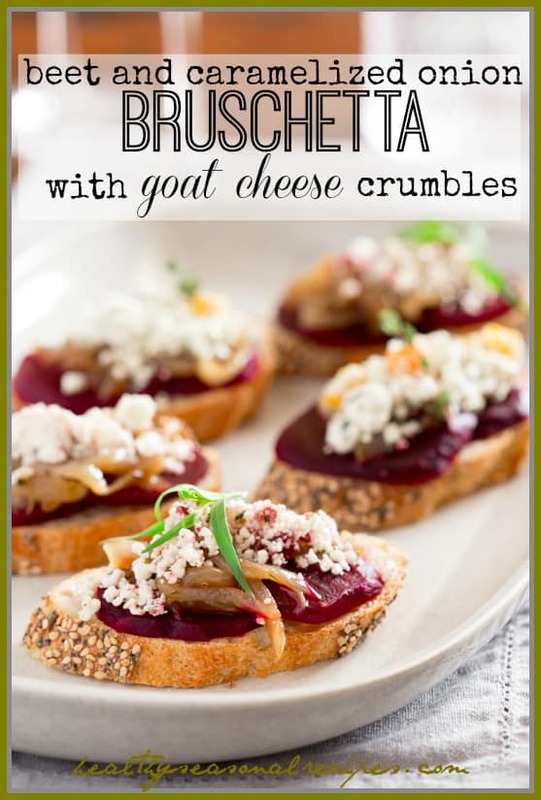 I love finding new options for goat cheese usuallyI just spread it on mini toasts or crackers. Going to have to try this awesome sounding option! A favorite snack is cheese spread with pita chips! My favorite food for a party is a dip (hot in the winter, cold in the summer) with toasted bread! Yum! Besides the usual (yummy brie, or brie with mushrooms or blue cheese and crackers), I love to bring a Tuscan kale salad – little strips of kale that have been “massaged” with olive oil, garlic powder and salt, then lemon juice added and grated Parmesan. It’s always a hit, even with people who think they don’t like kale! If I have a good cheese around, I like to make cheese wafers, especially with an aged cheddar. Squeeze up with butter, flour (rice flour is nice-next up to try is almond flour), a hit of cayenne. Roll into logs and chill, then slice and bake. Cut up any kind of apples and take out your party plate, a growler of local beer and head out.